Suspension system rear can`t be lowered if you don`t have a shock w adjustable ride height. Softening spring preload too much will give you a mushy and unstable ride. Front forks can be lowered by raising fork legs 10mm above normal flush position. Get a spring for your weight rear and lower saddle, you could gain around 10 mm there. Thanks for the speedy reply, my 907ie has the factory shock, does that help ? No it doesn't. As Gert said to adjust ride height you'd have to have a shock that has an adjustment option to make it longer or shorter. If you increase or decrease spring preload the shock will always have the same overall length. What will change is the sag. Decreasing spring load will increase the shock's sag meaning that if you'd then get on the bike it would come a little lower but at the same time the spring will become "softer". Adjusting preload is just to set the sag/suspension travel correctly not ride height. Some bike's ride height can be changed by replacing the arms of the swingarm/shock linkage with ones of a different length. Maybe that is also possible for the 907ie. Never really gave that a thought as it would change also leverage ratio. Of course that would require machining parts. but also you should find that you don't really need to flat foot the bike on both sides... i know that very cambered roads can be challenging. If you can get a few mm between the front (forks) and rear you might find that that's all the difference it takes. Otherwise you need to change the rear links which will change the ratio of the suspension but have the same shock travel so you don't have as much impact as you might think on the suspension. I've done this to a number of adventure bikes and dirt bikes for my dear lady wife without impacting much in the way of performance (she is faster than me anyway). The only problem is that no-one will have an off the shelf link for the Paso these days... if this was the Suzuki DRZ forum it would be a different story. Get your saddle worked out by a specialist to get it lower. You can win a few cm. But do not play with the geometry of the bike. That can be dangerous. Those are the adjuster rings for the spring preload. The more weight on the bike the more preload required to compensate which is why that decal shows a shorter spring length for more weight. If you lower those rings and compress the spring (ie shortening the spring length) it would increase preload and raise height. I wouldn't recommend doing the inverse as a way of lowering the bike as others have said, the spring needs to have some tension on it to retain it and prevent it from floating if you top out over a crest and the like. It also depends on your weight in respect of sag. Ideally you probably want about 30mm sag. I have just spent a little time adjusting the suspension on mine to where I like it. I'll probably do a write up on it at some point with photos for the benefit of others. The 907 has a decent range of adjustments on it, it's amazing the difference it can make to the bike setting it up correctly to your own preferences and weight etc. Some shocks have length adjustment on them and you may find one that fits, however it can throw the geometry of the bike out. I'm not sure how much movement there is to raise the front forks in the triple tree to drop the front ride height to match. I have a Tuono with fully adjustable Ohlins, the previous owner had lowered it and it was downright dangerous. If the axle line of the rear sprocket is much higher than the front sprocket spline, it can induce some horrible squat, whereas increasing the rear ride height can produce some desirable anti squat. Mine was virtually unridable. As others have said, best way is to try and take it out of the seat if possible. 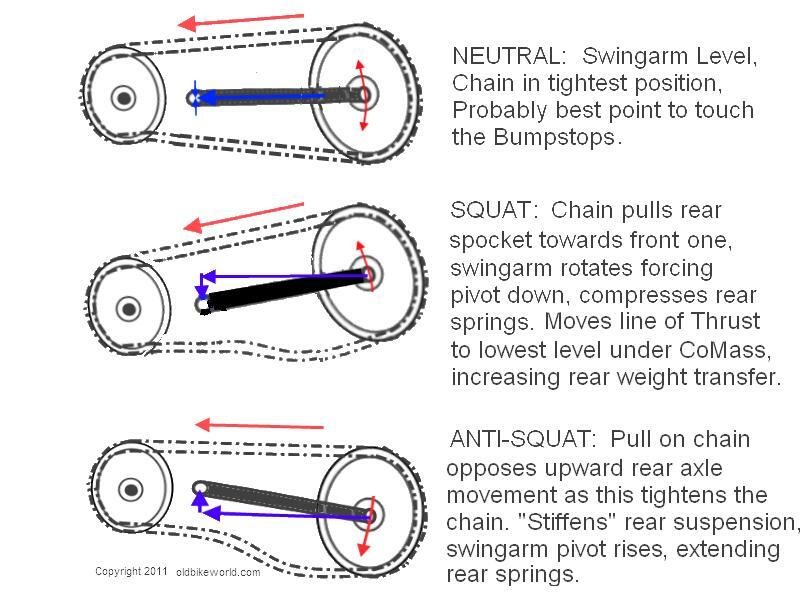 For those who like reading and haven't switched off yet, here is a good explanation and diagram from a website which is no longer active with regards to Squat. THE REAR END FIRST or I Don't know Squat! Because of this, I will commence the design & build from here. One of the most critical elements to good handling and getting power to the ground is the amount "squat/anti-squat" built into the bike. The effect of "squat" is often misunderstood as it is a bit counter-intuitive. If we watch a powerful bike, or an old style muscle car, take off and accelerate hard from a standing start, we often see the rear end dip or "squat" down. This looks great, the rear tyres are obviously being "planted" into the road, increasing traction…. SORRY…WRONG!. There are a number of things happening to cause the squat, but the end result is the tyre being lifted up towards the vehicle and away from the road. Result: Less traction and drive. Rotation of the bike around the rear axle, due to traction. Lifting the front end, transferring weight to the rear, and compressing the rear springs. SQUAT! Thirdly, the pull of the chain on the rear sprocket, resisted by the grip of the tyre on the track is attempting to push the bike forward through the rear axle and the swing arm pivot (a straight line, approximated by the swing arm ) If this "line of Thrust" is above the Centre of Mass (commonly called, centre of gravity), weight will be transferred to the front of the bike. If below the CoM the bike will rotate backwards transferring weight to the rear. More SQUAT!! !